At AquaKnox in The Venetian, Chef Tom uses his California heritage to approach innovative seafood, while maintaining classical techniques to support one of the best restaurants available on The Strip. AquaKnox is a global seafood restaurant that flies fresh seafood to Las Vegas from around the world. 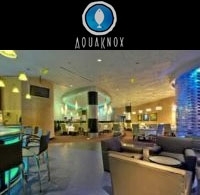 AquaKnox offers a superb raw bar, extensive wine list, and a lounge for enjoyment into Las Vegas' later hours. AquaKnox offers an international wine list with over 160 selections, 20 of which are available by the half-glass, glass or half-bottle quartino. AquaKnoxÂ’s decor creates an ocean theme for the restaurant that enables guests to experience a cool enviroment highlighted by a water encased, walk-in wine tower, an integrated raw bar, and a state of the art open kitchen. AquaKnox popular specialties include Stone Crab Claws, Caviar, Grilled Lobster with Drawn Butter, Pan-seared Filet Mignon with Truffle Aioli, Butternut Squash Soup with Duck Confit and Apple Compote. OPEN HOURS Everyday: 5:30 PM to 10 PM.